I am Associate Professor at the Interactive Intelligence group at TU Delft. My main research interests lie in what I call interactive learning and decision making: the intersection of AI, machine learning and game theory. I try to generate fundamental knowledge about algorithms and models for complex tasks. In addition, I think about how such abstract models might be applied to challenging real-world tasks such as collaboration in multi-robot systems, optimization of traffic control systems, intelligent e-commerce agents, etc. For more information about my research, look here. For research opportunities, look here. For more information about possible student projects (current TU Delft students), look here. February 27th, 2019: At AAMAS: Deep learning of Coordination…? Can deep Q-networks etc. brute force their way through tough coordination problems…? Perhaps not. Jacopo’s work, accepted as an extended abstract at AAMAS’19, takes a first step in exploring this in the one-shot setting. Not so surprising: “joint Q-learner” can be too large/slow and “individual Q-learners” can fail to find good representations. But good to know: “factored Q-value functions” which represent the Q-function as a random mixture of components involving 2 or 3 agents, can do quite well, even for hard coordination tasks! November 28th, 2018: Looking for colleagues! We are looking for faculty in AI! Join the INFLUENCE research team! I am looking for a 3-year Postdoc in Influence-based Abstraction, Learning and Coordination. Find me at #IJCAI2018 to informally discuss. My invited IJCAI paper giving an overview of (some of, apologies to some coauthors, could not fit everything there….) my research is now available from my publications page. I’m going to IJCAI: I have been invited to give a talk in the IJCAI-ECAI ’18 Early Career Spotlight track – I feel very honored. 2 PhD, and 1 postdoc vacancy are now live. Apply by 23rd of April! August 2017 Great news: I have won an ERC Starting Grant! August 2017 Our article on active perception is published in Autonomous Robots. May 2017 EPSRC will fund my ‘first grant’ proposal. I will be looking for a postdoc with interests in multiagent systems, deep/reinforcement learning. April 2017 Our AAMAS paper is nominated for best paper! Feb 2017 MADP Toolbox 0.4.1 released! Feb 2017 AAMAS accepted our paper on Multi-Robot Warehouse Commisioning, yay! Oct 2016 My student Elise’s thesis on traffic light control via deep reinforcement learning will be presented at BNAIC. We also have a video that nicely illustrates the behavior of our novel deep Q-learning+ transfer planning approach. (also described in this demo paper). A NIPS workshop paper is under submission, let me know if you are interested. Aug 2016 I am co-organising the NIPS workshop on Learning, Inference and Control of Multi-Agent Systems taking place Friday 9th December 2016, Barcelona, Spain. Join us! Jul 2016 The book on Dec-POMDPs I wrote with Chris Amato got published! Check it out here or at Springer. Apr 2016 Our paper on PAC Greedy Maximisation with Efficient Bounds on Information Gain for Sensor Selection is accepted at IJCAI. I will also present the poster at AAMAS in Singapore. Dec 2015 AAAI ’16 has accepted 4 of my papers and they are now on my publication page. July 2015 I am coorganizing the AAAI spring symposium on Challenges and Opportunities in Multiagent Learning for the Real World. While multiagent learning has been an active area of research for the last two decades, many challenges (such as uncertainty, partial observability, communication limitations, etc.) remain to be solved…! April 2015 MADP v0.3.1 released! April 2015 Yay – IJCAI has accepted three of my papers! Factored Upper Bounds for Multiagent Planning Problems under Uncertainty with Non-Factored Value Functions. Point-Based Planning for Multi-Objective POMDPs. Secure Routing in Wireless Sensor Networks via POMDPs. February 2015 Our article Computing Convex Coverage Sets for Faster Multi-Objective Coordination was accepted for publication in the Journal of AI Research. Januari 2015 Our work on computing upper bounds for factored Dec-POMDPs will appear at AAMAS as an extended abstract. Check out the extended version. Januari 2015 AAMAS has accepted our work on spatial task allocations problems (SPATAPS), see here. November 2014 AAAI has accepted two of my papers! One is about exploiting factored value functions in POMCP. The other investigates the use of sub-modularity in the full sequential POMDP setting. October 2014 A recent development in Dec-POMDP town is that these beasts can be reduced to a special case of (centralized) POMDPs. Chris and I decided it was time to try and give a quick overview of this approach in this technical report. July 2014 I started as Lecturer at the University of Liverpool. May 2014 It’s been a while, but we are releasing a new version of the MADP Toolbox ! Download it now: here. We are interested in your feedback, so let us know if you have problems or suggestions. April 2014 Chris Amato and I are doing interesting things on Bayesian reinforcement learning for MASs under state uncertainty. See our MSDM paper and technical report for more information. December 2013 Our paper Bounded Approximations for Linear Multi-Objective Planning under Uncertainty was accepted for publication at ICAPS. December 2013 Good news from AAMAS: A POMDP Based Approach to Optimally Select Sellers in Electronic Marketplaces and Linear Support for Multi-Objective Coordination Graphs both got accepted as full papers! October 2013 Our paper Effective Approximations for Spatial Task Allocation Problems was runner up for best paper at BNAIC. July 2013 I have been awarded a Veni grant for three years of research! June 2013 Presentations of AAMAS and an invited talk at CWI can now be found under Research highlights. April 2013 My paper Sufficient Plan-Time Statistics for Decentralized POMDPs is accepted at IJCAI 2013! April 2013 Christopher Amato and I are working on Bayesian RL for multiagent systems under uncertainty. See our paper here. 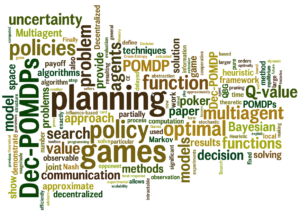 February 2013 JAIR has accepted our article Incremental Clustering and Expansion for Faster Optimal Planning in Decentralized POMDPs for publication! December 2012 Our paper Approximate Solutions for Factored Dec-POMDPs with Many Agents is accepted as a full paper at AAMAS 2013! December 2012 Our paper Multi-Objective Variable Elimination for Collaborative Graphical Games is accepted as an extended abstract at AAMAS 2013. June 2012 Our paper Exploiting Structure in Cooperative Bayesian Games was accepted at UAI 2012! June 2012 Yay! I won the best PC member award at AAMAS 2012! June 2012 The 7th MSDM workshop was very interesting! Check the proceedings at the MSDM website. April 2012 Two of my papers will appear at AAAI! January 2012 My book chapter on decentralized POMDPs is finally published! It can be used as a introduction to Dec-POMDPs and also provides insight on how the current state-of-the-art algorithms (forward heuristic search and backward dynamic programming) for finite-horizon Dec-POMDPs relate to each other. December 2011 Two of my papers will appear at AAMAS: a full paper about heuristic search of multiagent influence and an extended abstract about effective method for performing the vector-based backup in settings with delayed communication. July 2010 I’ve started at MIT on July 15th! Look my thesis is on google books! February 2010 On February 12th 2010 I successfully defended my thesis, titled “Value-Based Planning for Teams of Agents in Stochastic Partially Observable Environments”. Prashant Doshi and his students Christopher Jackson and Kennth Bogert used the multiagent decision project (MADP) toolbox to compute policies in the game of StarCraft. Watch the (pretty cool) video.